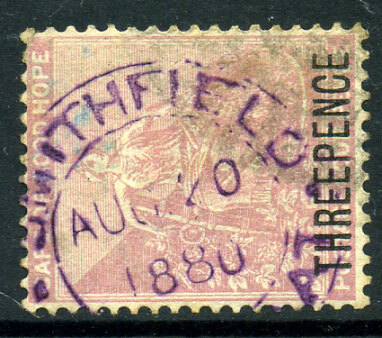 Railway Office dated AP 30 97 on 1d (SG.68). Railway Office dated 4 NO 91 on horiz. 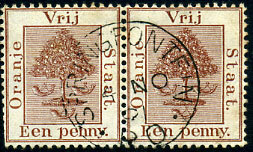 pair 1d (SG.3), some clipped perfs. 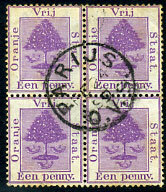 A/SP 21 93 on 1/- (SG.9). 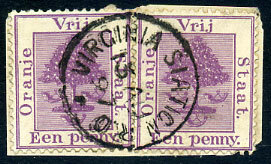 dated FE 16 96 on 1d (SG.68). 15 AU 97 on 2 x 1d (SG.49) piece. 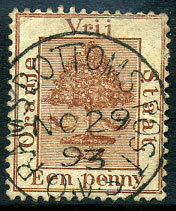 (CDS) DE 5 91 on 1/- ovp'd "T F" (SG.85). (CDS) NO 29 93 on 1d (SG.1). 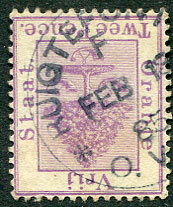 FE 24 99 on block of four 1d purple (SG.68), reverse toning and some lower central perf. splitting. 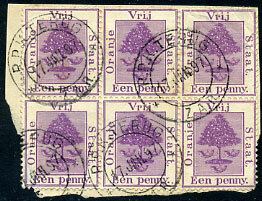 (D/R) in purple with O.V.STAAT at base dated AUG 20 1880 on CGH THREEPENCE on 4d pale dull rose CC wmk (SG.35), weak corner perf.